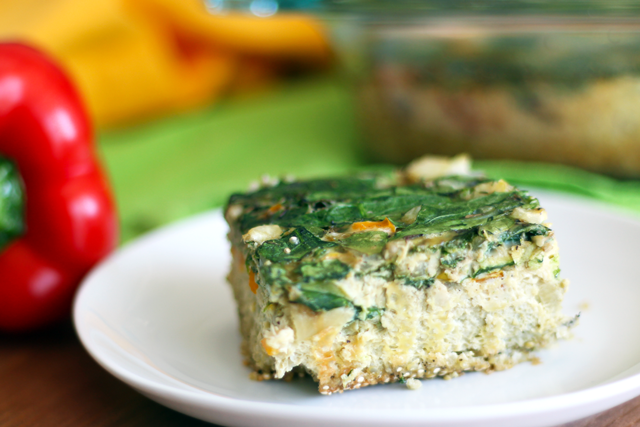 Say hello to one easy and healthy breakfast bake! I meant to get this posted weeks ago, but I’ve been behind on everything due to some health issues. Basically, I’ve been having problems falling asleep…BIG time. I am taking steps to figure out the problem, but pretty much all aspects of my life will suffer for a time while I lie low and recover. Unfortunately, this is not something that will linger for a few weeks and pass, like a cold. Needless to say, the overachieving lifestyle does not work for me right now. And not getting sleep has been affecting my desire to cook in general and certainly my blogging. I’ve been struggling with it for about a month, and while the problem is better, I am still working to get back to normal. So I do apologize for my infrequent posts. I am also more motivated to make meals healthier than ever, so expect a healthy menu! I am avoiding alcohol, wheat, and sugar, and anything else that might make my hormone levels spike and keep me up at night. Here’s a recipe that combines all my needs into one! It’s a hearty and simple breakfast bake that’s dairy-free and gluten-free. This quinoa egg bake is very much like a quiche, but with a healthier crust–it’s the quinoa, of course! The idea of this recipe is that the veggies are supposed to float towards the top while the quinoa sinks to the bottom. Make sure to chop your veggies finely to achieve this. 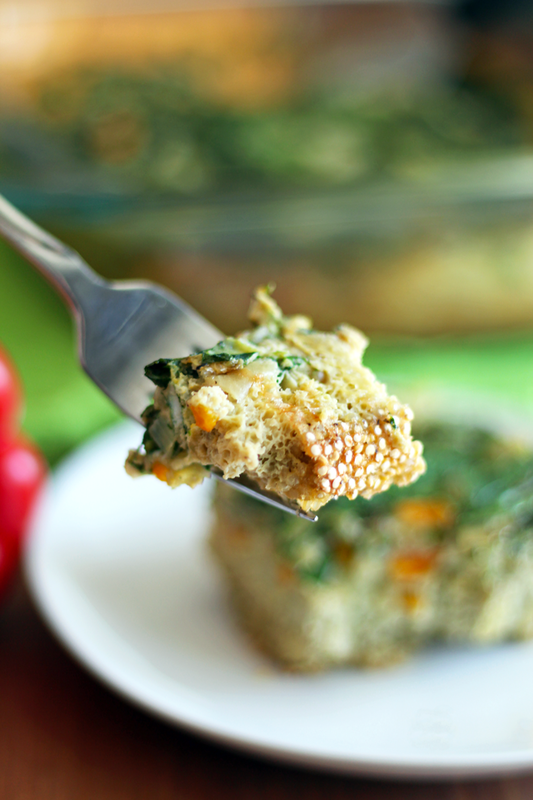 Once you pour the egg mixture into the baking dish, you will start to see the quinoa sinking to the bottom. Shake the dish a little bit to help the process along. Some quinoa will probably sit on top of the veggies. Using a spoon, lightly push that quinoa back into the egg mixture. It’s okay if all the quinoa doesn’t get to the bottom. You might find that the quinoa has sunk to one side. Just manipulate it by stirring some back to the other side of the dish and letting it sink to get an even crust. This recipe is very versatile. You can omit the onions and peppers and only use spinach, or you can add finely chopped sausage or bacon and shredded potatoes. Another idea would be to drop in dollops of goat cheese along with tomato and basil (make sure you squeeze the liquid out of your tomatoes). You can adjust the seasonings as well to fit your needs. Try sage and rosemary in place of the granulated garlic. Vegan cheese would also be a great addition to this dish, although I recommend reducing the salt to half a teaspoon if you will be using a high salt content cheese. This Quinoa Egg Bake showcases the flavor of your eggs. Fresh, great tasting eggs will greatly add to the overall flavor. I used Egglands Best, but if you can afford it, organic pastured eggs add so much more yum. I found this recipe on the Whole Foods website, tried it dairy-free, and loved it so much I decided to make it my own. It’s easy to make, super healthy, and high in protein. I just love how you throw everything in, shake, and bake! Simple! Preheat oven to 350 degrees Fahrenheit. Generously butter the bottom and sides of an 8x8 baking dish (you may want to use a nonstick pan for easy removal, but is not necessary). Sprinkle a small amount of black pepper, sea salt, and granulated garlic on the bottom of the dish. This will aid in flavoring the crust; set aside. Rinse your quinoa if the packaging calls for it. ***In a large bowl, whisk together eggs, almond milk, garlic, thyme, black pepper, sea salt, and quinoa. 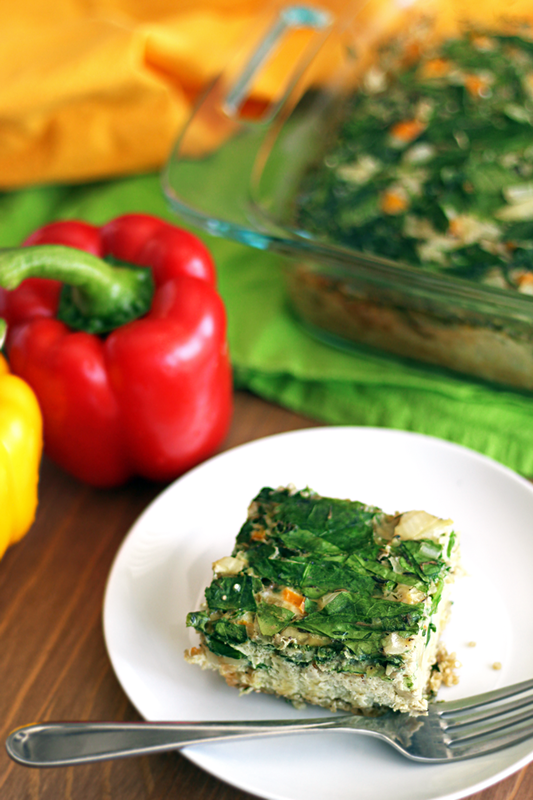 Stir in chopped spinach, onion, and pepper, then pour the mixture into the buttered baking dish. Shake the dish slightly to make sure all quinoa has sunk to the bottom in an even layer. If you are using a glass dish you will be able to see it and make adjustments. Cover tightly with foil and bake until just set, about 50-55 minutes. Let cool for five minutes before serving. *I use Earth Balance Buttery Spread. **I use Blue Diamond Almond Breeze Original. I’ve made these pancakes a bunch of times, but I hadn’t found the right opportunity to blog about them until now. Not only have I been trying (extra emphasis on that word trying) to go gluten free, but my best friend is trying out the Paleo diet with her husband. She is a supportive wife, that’s for sure. I know how much she likes her Nutella and milkshakes and pasta. That really got my brain going. I’m always thinking of creative food options to meet different needs. I instantly thought of eggs baked in an avocado, eggs fried in a pepper ring, and my usual breakfast, a spinach and egg scramble. Then she said she wasn’t into eggs that much. Hmmmm. A lightbulb clicked on above my head and I thought of my simple almond meal pancakes! Now, neither of us knew much about the Paleo diet, but we tried to guess based on quick research. If it’s okay to eat almonds, then it should be okay to have almond meal. My pancake recipe calls for a tablespoon of maple syrup. We weren’t sure about that one… but they really don’t need the sweetener! It’s just a sweet, sweet bonus. So I replaced the tablespoon of maple syrup with a tablespoon of water. And, oh my. That berry reduction and coconut cream. This is definitely a Paleo dessert! It’s made with healthy whole foods with no added sugar and the protein content is high, but the almond meal and coconut cream have a lot of fat. It makes sense to limit your intake of nut products and full fat coconut milk. The berry reduction is also high in natural sugar. It’s pretty tasty though, so is that okay? Yes. Unless you are very strict about your diet, I say ok.
Don’t let the small pancakes fool you; this is a very filling meal. Remember, it’s almond meal, not flour. This serves two people. I recommend making the berry reduction ahead of time and storing in the refrigerator for up to a few days. Reheat before serving or enjoy cold like jam. I used the coconut whipped cream tutorial from Oh She Glows. The almond meal pancakes are adapted from Laura Dolson’s recipe on about.com. This post is dedicated to the wives who try to follow diets their husbands are following to support them (and vice versa)! Go you! 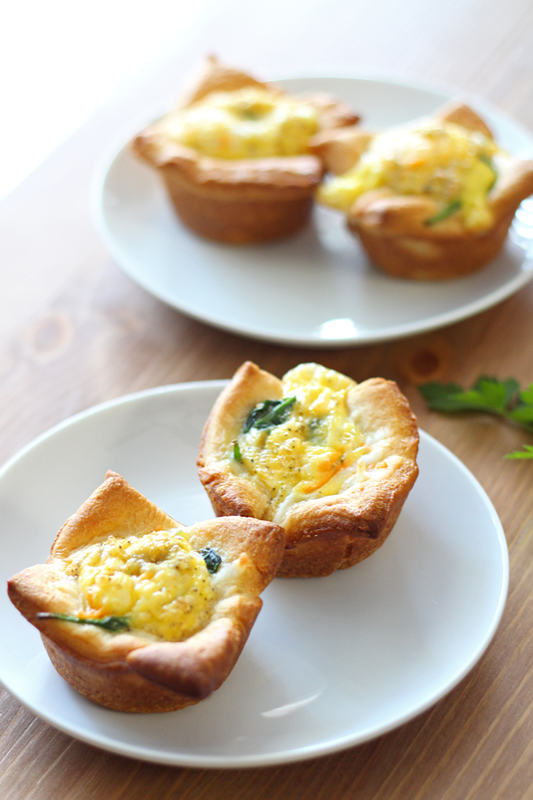 A high protein, dairy free, gluten free, and Paleo breakfast option. Add berries to small saucepan over low heat. When berries begin to defrost, stir to speed up the process. Cook for 10-15 minutes or until berries are broken down and liquid is reduced, stirring occasionally. Whisk almond meal, eggs, 1/4 cup water plus 1 tablespoon of water, and sea salt until well combined. Add melted coconut oil and thoroughly mix. Preheat a non stick pan or griddle over medium low heat and add a little coconut oil for frying. Using a 1/4 cup, pour the batter onto the griddle for little pancakes. Use your cup to spread the batter if it's very thick. You want thin pancakes. Cook for about two minutes then flip. They will start to have very small bubbles when ready to be flipped, not big ones like typical flour pancakes. Once the other side is done, remove from griddle to a plate to keep warm. 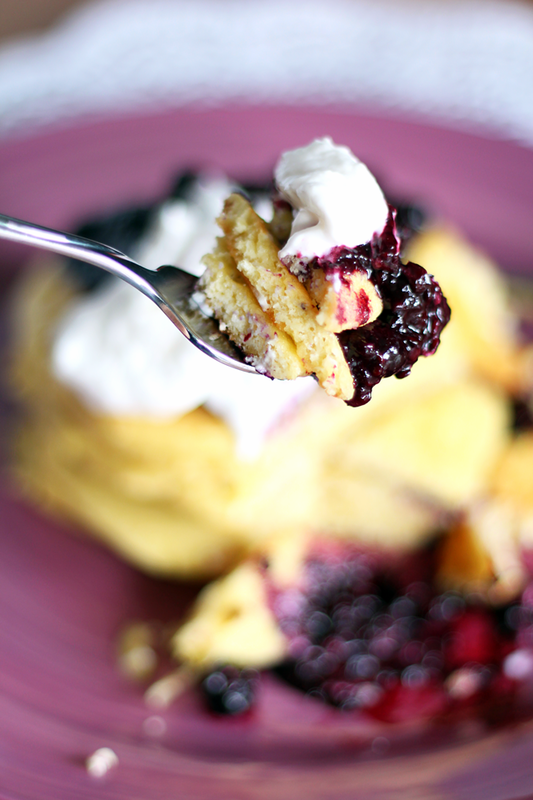 Stack them, add berry reduction, and top with coconut whipped cream. This has no added sugar? Your tastebuds won't believe it. *You can use regular tap water. I used sparkling to add bubbles and make the pancakes fluffier. If you are not averse to extra sugar, replace the tablespoon of sparkling water with 1 tablespoon of maple syrup. It's not necessary for taste, but it does make them sweeter. **I followed the Coconut Whipped Cream Tutorial from Oh She Glows. I didn't add any sweetener or vanilla to the cream. 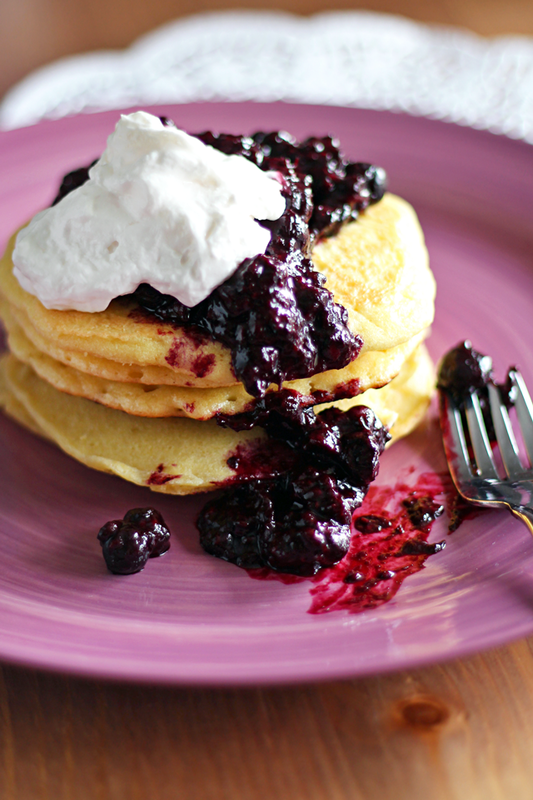 You could also just scoop the chilled coconut cream out of the can and dollop it on your pancakes to soften on the hot berry reduction. It will taste the same but won't have the thick, whipped texture. Did you try it? How did you like it? Leave me a comment! I’m always looking for easy, dairy-free breakfast options. I envy the people who can just pop a hot pocket into the toaster oven and call it a day. I’m also big on BIG breakfasts. I need something substantial AND healthy AND delicious in the morning–cereal just doesn’t cut it. My husband loves healthy cereals like Kashi, but I think they taste like cardboard. I’m reminded of that Willy Wonka quote from Charlie and the Chocolate Factory: “Do you have any idea what breakfast cereal’s made of? It’s those little curly wooden shavings you find in pencil sharpeners.” Yep, pretty much. Sorry cereal lovers. Usually, I’ll make a spinach and egg scramble in the morning. The whole process only takes five to ten minutes, depending on if I’ve had my coffee or not. But here’s the thing–I also crave variety. When you are absolutely forbidden from having something in your diet, you need variety to make up for the the lack of it. 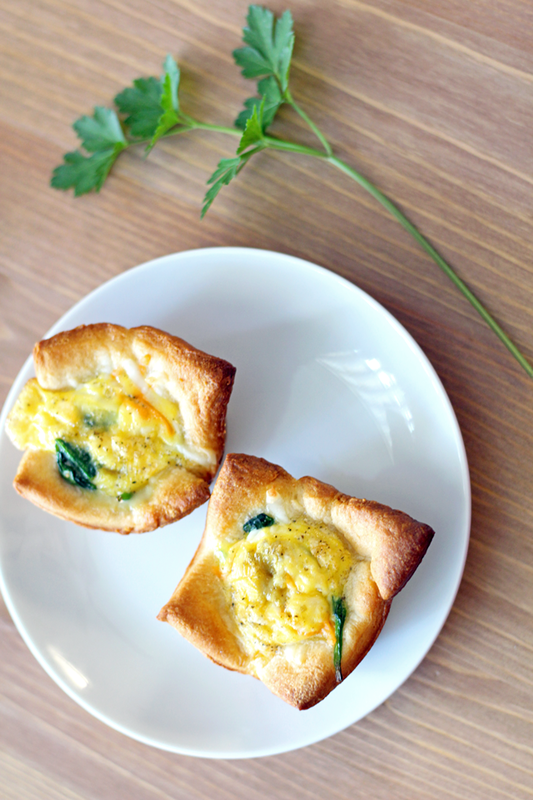 So I changed up my spinach and egg scramble the other day to include some yummy crescent rolls, making pretty, tulip-shaped mini quiches that are perfect for on-the-go breakfasts. 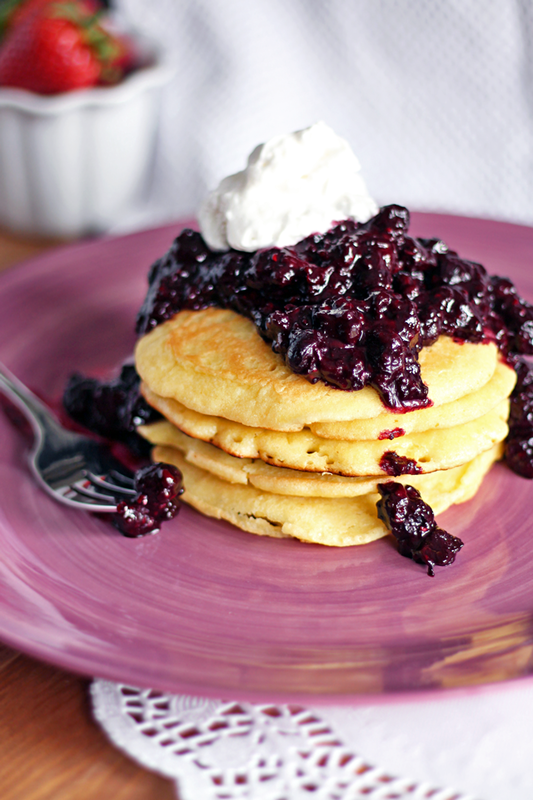 These take a little extra time in the morning–but not much. They are super easy to make and fun to share. They would be a great addition to a weekend brunch! I do my best to stay away from Pillsbury dough, because it usually contains dairy and hydrogenated oils. You can find dairy-free and trans-fat-free crescent rolls at Trader Joe’s and Whole Foods. You can customize this recipe by adding your favorite veggie combination. Just make sure to not overfill each quiche. As you can see in the above picture, I added just a tiny bit of filling to each quiche cup and added egg to just below the edges of the dough. The egg mixture will rise. If you are adding tomatoes, make sure you press the liquid out of them on a paper towel, or else your quiche will be too watery. It’s up to you if you’d like to cook the veggies beforehand. I needed to sauté the spinach to fit in the quiche. I plan on making these again soon with bacon and potatoes, yum! Roll out the crescent roll dough onto a cutting board and seal the seams so it it is one seamless sheet of dough. You can use a rolling pin, but I just pinched the seams together with my fingers. Cut dough into six equal squares. Spray six cups of a regular size muffin tin with cooking oil. Place a dough square in each tin, making sure to center it so an even cup is formed. All four corners should be lying outside the cups. Add your choice of veggies. I quartered 6 grape tomatoes, then pressed them into a paper towel to absorb excess liquid. I sautéed a handful of spinach in a little olive oil and salt so it would fit in the quiche cups, then distributed all veggies equally. Add a sprinkle of vegan cheese, or another yummy ingredient, like fresh herbs or bacon. In a small bowl, whisk two large eggs together with salt and pepper. 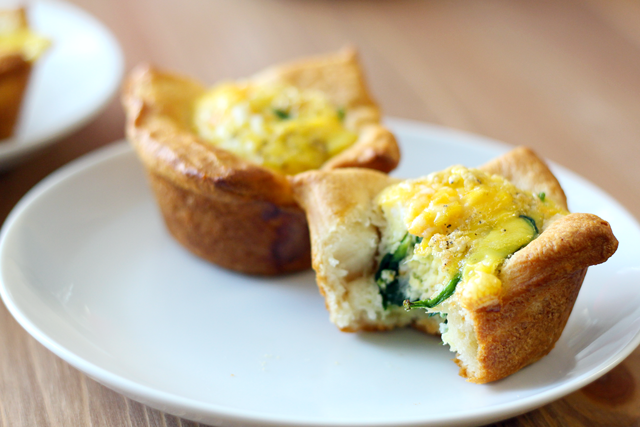 Pour a very small amount of egg mixture into each quiche cup and overtop of veggies, being careful not to overflow. 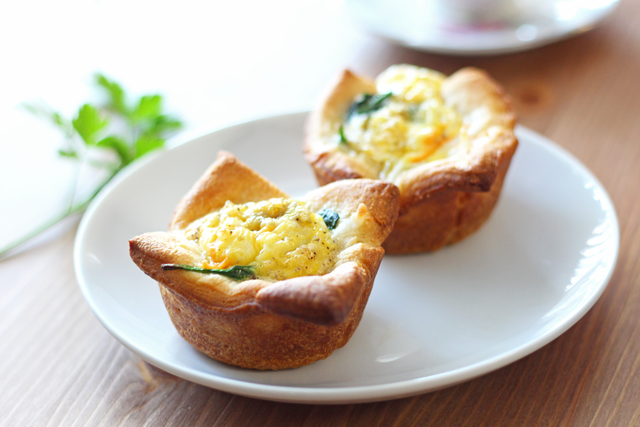 Two eggs will distribute perfectly into the six quiche cups. Bake for 16 minutes, or until eggs are set. If needed, a couple extra minutes will not burn the dough, and eggs will set unless filled too full.